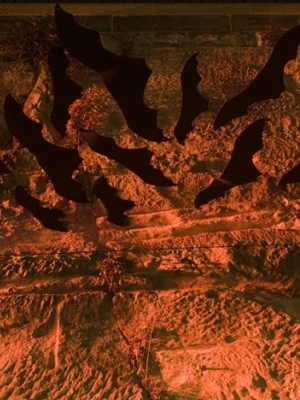 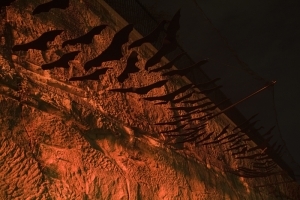 Artists Ruth McDermott and Ben Baxter's installation at Observatory Hill, The Rocks, evoked memories of the nightly bat migration that has existed in areas of Australia for thousands of years, while the sandstone reminded them of the amazing natural landscape on which Sydney exists. 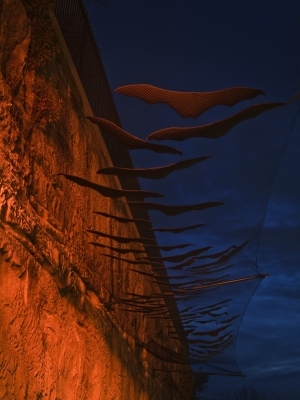 The 18 meter long installation used netting to support the bat cloud. 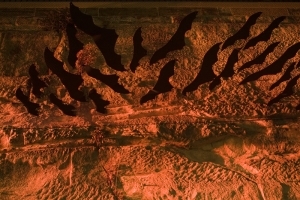 The colours of sunset&nbsp;&nbsp;were used to wash across the magnificent sandstone wall to act as a fitting backdrop for these creatures of the night as they farewell the day.